Ian first sat behind the kit at the age of eight, after his father, an enthusiastic hobby drummer, brought home a mongrel kit from a band rehearsal. For Ian, it was an epiphany. He began studying with the revered Hampshire drum tutor, Albert Cooper, cutting his teeth on his first band at the age of fourteen, playing with musicians ten years his senior. Inspired greatly by the incredible RAOC drummer, Ray Smith, by eighteen, Ian was earning his living on the cruise-ship scene, moving into studio sessions, theatre, radio, television and depping work over the next four years. Studying for a time with the UK's leading tutor, and Mapex artist, the famous Bob Armstrong, by his mid- twenties, Ian was in demand by studios and live bands alike for his musical approach to the kit, and natural, technical control. 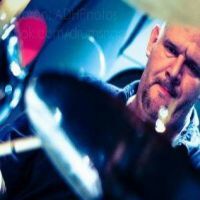 In 2003, Ian moved to Buckinghamshire, opened his drum school, The Drum Room and began teaching in schools both public and private across of Bedfordshire, Oxfordshire, London Cambridgeshire and Buckinghamshire. In 2009, Ian was invited by Vic Firth to join their international education team, and the Hudson Publishing Education Team. In 2014, Ian was invited to join the renowned Echo Factory Music Academy as a visiting faculty tutor / clinician. Ian is a Faculty Tutor / Clinician at the renowned Echo Factory, the new music academy in Leicester, and as a result of his 25 years’ experience as a professional drummer, is very pleased to be officially endorsed by Evans Heads, Liberty Drums UK, Impression Cymbals, ProMark Sticks, Cymbomute and Tunerfish and holds clinics in association with them across the UK for music schools, drum retailers, and youth organisations. He has a monthly column, ‘Bee’s Buzz’ in Drumhead Magazine and contributes to Digital Drummer, the online magazine. Much of his work is short notice depping for bands across the UK, and his private teaching business in Bletchley – he is personally recommended by Paul Weller’s ex-drummer, Steve White (now with the Family Silver). Recent productions include The London Drum Show on the Liberty Drums stand, Jesus Christ Superstar, CD Unplugged, Cinderella, and shared the bill at The Best Of British drum event in London, with such luminaries as Ralph Salmins, Ash Soan and Nick Mason!